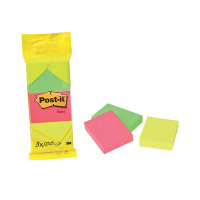 Everybody knows and loves Post-its, they are reliable, versatile and environmentally friendly. And now, they are neon! Each pack of neon Post-its contains 1 pad each of neon red, green and yellow, with 100 sheets in each pad. The paper features an environmentally friendly adhesive. Ideal for use at home or in the office, they will certainly brighten up your paperwork, and your day!